David Norris and Gary Dobson launch appeal against their convictions for the racist murder of teenager Stephen Lawrence in south-east London in 1993. David Norris will appeal on the basis that the use in evidence of a surveillance video was unfair, his lawyer confirms. The “Footscray” video showed David Norris and Gary Dobson using violent racist language. Papers have also been received at the Court of Appeal from Gary Dobson’s solicitors, setting out his intention to appeal. David Norris, 35, and Gary Dobson, 36, were sentenced to life after being found guilty by an Old Bailey jury at the beginning of January. Gary Dobson was ordered to serve a minimum of 15 years and two months, and David Norris 14 years and three months. David Norris’ lawyer said the appeal will be based on the grounds that about two thirds of the way through the case, what had been a scientific case about forensic evidence became a case about a surveillance video made of the men. He said was unfair, because the case was about scientific evidence and the video could not prove he was at the scene of Stephen Lawrence’s murder. Meanwhile, the Attorney General is reviewing the minimum terms given to the pair following a request from a member of the public and is due to report back in the next few days. 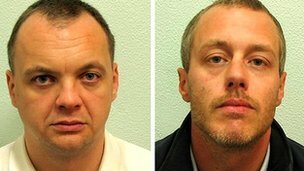 Gary Dobson and David Norris were the first people convicted over the fatal attack on Stephen Lawrence by a group of white youths near a bus stop in Eltham on 22 April 1993.